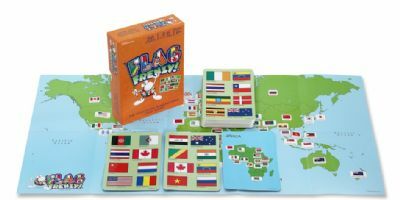 In Flag Frenzy!, players try to match flags on cards in their hands with flags on the table, emptying their personal card deck before anyone else can. Flag Frenzy! consists of 49 flag cards and 8 continent cards (two each of Europe, Africa, Asia and the Americas) each flag card shows eight flags, and any two flag cards have exactly one flag in common, similar to the cards in Catch the Match and Spot It! Game play differs from those titles, however, as two cards are placed face-up on the table at the start of play while the remainder of the deck is distributed evenly among the players. All players take two cards in hand, then everyone simultaneously tries to play onto the face-up cards by spotting the matching flag and giving its country*s name when playing the card. With a continent card, the player has to name a flag on the continent being played. After playing one or two cards, the player refills her hand. The first player to play all of the cards in her deck wins.